Police in Lille, France, are hunting a gunman who shot dead two people and injured five at Theatro nightclub after being turned away. He opened fired indiscriminately outside the Theatro club in the city centre at about 03:00 a.m..
A senior police official said a heavy-calibre gun, possibly a Kalashnikov rifle, had been used. France recently tightened its laws on illegal firearms amid a worrying rise in the use of guns by criminals. French media say the attacker had an accomplice waiting in a car and seemed to have taken the gun from the boot because he returned to the club shortly after being turned away. Condemning the attack, French Interior Minister Manuel Valls promised police would do all in their power to apprehend the killer and bring him to justice. “The bouncer who knew the man turned him back,” said Herve Malherbe, deputy police chief for the northern region. 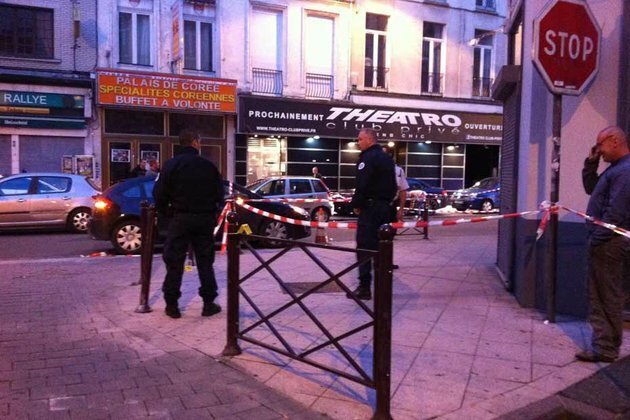 Those killed were a female cloakroom attendant, 26, and a male customer, 25, local newspaper La Voix du Nord reports. Five people, including a bouncer, were injured by bullets or bullet fragments, and four of them underwent surgery in hospital. None is in a life-threatening condition. A further six people were treated for shock. An AFP correspondent saw numerous bullet casings scattered across the street where the shooting took place. One of the Theatro’s customers, named only as Jeremy, told the news agency that he had been on the dance floor when he heard a shot. “At first I thought it was a firework,” he added. Another customer said he had mistaken the sound of the shooting for bottles being broken. “It’s disgusting, this isn’t the Bronx,” he said. The killer and his accomplice fled in their car, said to be a Golf or a Citroen C5. France’s gun laws were tightened in March, with longer jail terms and bigger fines for illegal possession of fire-arms. Dozens of shootings involving Kalashnikov rifles have been reported in recent years in France, and particularly the southern city of Marseille. Typically they have been gangland settlings of scores.